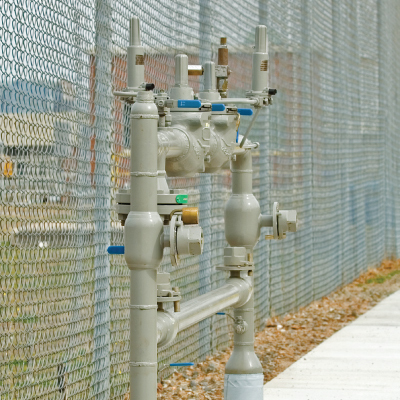 Backflow is the reversal of flow direction in the pipeline system. It occurs when there is a change in water pressure. The danger of backflow is in that drinking water can become highly contaminated by any number of substances if it is not controlled. Making sure you keep the backflow under control is one of the best ways to make sure you keep yourself and others healthy—and protect yourself from potential lawsuits too. The number one way that backflow is prevented is by installing a “backflow preventer.” This simple device is required for irrigation systems that are connected to city water and some private wells that are used for drinking too. Also, many commercial buildings are required to have preventers installed as well. Testing is required to be completed on these devices to assure that the backflow prevention device works properly. How does the test work? A certified tester, such as one of our specialists at Top Dog Plumbing, will use a specially calibrated test kit. The water downstream of the device is shut off during the short test. Then, it is possible to see if the backflow preventer is doing its job correctly. Make sure you are proactive and have this testing regularly completed, so you can find any problems and resolve them quickly. After all, no one wants to think about what backflow could mean for the water supply. In the instance that the backflow preventer isn’t working properly, Top Dog Plumbing can also assist you with completing the repairs necessary to get it working again. After all, this is such an important piece of your overall plumbing system that it is vital it works its best. We’ll do everything in our power to help you with the process, and we will make it happen quickly and affordably. Backflow and backflow testing are complex matters. We understand this. Feel free to give us a call and let us walk you through the process. We never mind helping, and our knowledge about these matters are unsurpassed. Customer service the one thing that helps us stand apart from the competition. Backflow testing and repair are imperative tasks for many businesses and even some home owners. If you need assistance with this vital plumbing task or any others, call us at Top Dog Plumbing today. We are Boise’s #1 choice for all your plumbing needs.